I do a load of laundry every day. 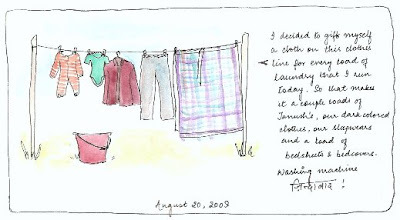 Whether any other chore around my house gets done or not, laundry and dishes have to run at least once a day. But somehow I had managed to secure a mountain of clothes this once (despite still running a load each day..)!! Clubbed under the Dark-clothes-wash-separately and Bedspreads-wash separately, they had actually piled up! So to keep myself inspired till I finish the whole lot I had decided that I would add one cloth item to this clothes line, as I finish washing and drying it.. And so this clothesline got populated!! !